The fixtures for the forthcoming season are now available to view/download online, East and West. A great night at county Oak last night for the Reg Harding cup. Congratulations to the West on their 7 - 2 victory over the East. Well played East put up a great fight. Winning players each receiving £30 are:- Andy Macintosh, Cliff Prior, Connor Levett, Ricki Blay, James Greenfield, Tony Ayres, Jason Yates, Tony Peters, Paul Eves. MoM Receiving £20 James Greenfield with a 34.81. Bull shoot winner taking £96 James Greenfield. Football Card winners each receiving £20 Andy Macintosh and Andy Haggis. Thank you County Oak for hosting and generous donation to the prize fund, Kevin Judge for all his help both before and on the night, Claire King for selling footy cards and bull shoot tickets. Congratulations to Worthing who defeated Newhaven 5-4 last night to win the 2018/19 Divisional Play-off. MOM with a 29.12 was Andy Stanford from Worthing. Full Results can be found here. East and West top nine will be held at County Oak this year on Wednesday 27th March. Please come and support. Please note that both the Men's and Ladies teams have moved venue with immediate effect. They are now playing from the Sportsman, St. Floras Rd, Littlehampton BN17 6BD. PLEASE NOTE 3 VENUE CHANGES IN THE WEST DIVISION. LITTLEHAMPTON, NUMERALS AND WORTHING. THE UPDATED CONTACTS ARE NOW AVAILABLE IN THE SUPERLEAGUE PAGES. They can now be viewed on the website. Full fixtures can be found here. 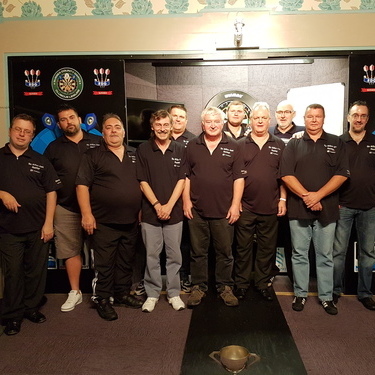 The Sussex County Summer Super League playoffs at the County venue, the Clubcue Leisure in Worthing on Sunday featuring three competitions and attracted a good crowd from across Sussex. The Pairs event was won by Tony Ayres, representing the West Division’s Littlehampton partnered by Eastbourne player Jim Withers. They defeated the Littlehampton duo Simon Wood and Adrian Linfield by 3-1 in the final, collecting the “Harveys” Rosebowl plus £160. Losing semi-finalists were Connor Levett/Lewis Gurney, Lancing Whippet and Todd Rainsley/Paul Eves from Newhaven. Last season’s Winter Super League Singles champion Joe Davis completed the double when he won the Summer league event, taking the “Brookes Sports” cup with its cash prize of £160. The Southwick player defeated Simon Wood, Littlehampton 3-1 in the final and the losing semi -finalists here were Jim Withers, Eastbourne and Paul Robinson, Whippet Numerals. 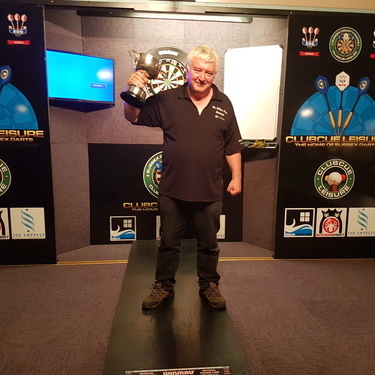 In the final event of the day Eastbourne’s Jim Withers completed a double when he took the prestigious Champion of Champions Singles, the competition staged for the winners of Man-of-the-Match awards during the season. Jim collected the £160 cash prize after defeating Newhaven’s Paul Eves 3-0 in the final. The losing semi-finalists were Paul Robinson, Whippet Numerals and Tony Ayres, Littlehampton. Ten players shared the Competition prize fund of £940 and more than £2000 was distributed to the fourteen teams in the League. Joe Davis v Jim Withers in a match to march onto Bridlington both playing great darts all day Joe managed to come out on top on this occasion 2-1 in sets. Then in the other Final young Alfie Stredwick who I’ve been hearing good things about. came of age going all the way to Bridlington with a deciding leg victory to say I was amazed by his laid back attitude and at ease he looked is a understatement well done Alfie. A little mention to all the girls well done for representing the county with Hayley Gatford making the semi final Claire King Lisa Withers Rhonda West. 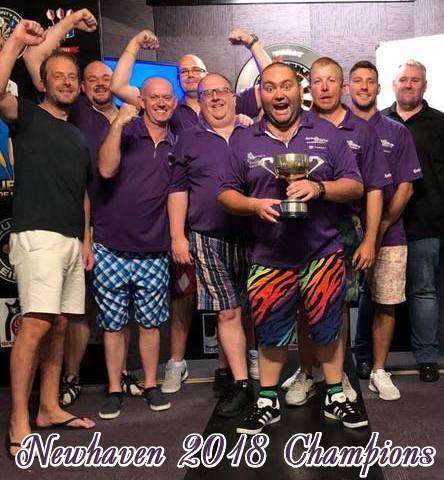 Newhaven kept the County Super League Championship in the East Division for the fourth year running in an exciting playoff at the Clubcue Leisure, Worthing, defeating the West Division winners Worthing by 5-4. The Engineer team had previously won their Division by five points from last season’s champions Hastings losing two of their twelve matches. this summer and they had beaten off a strong challenge from previous winners Littlehampton to take the West Division title by four points. Paul Eves started the ball rolling for Newhaven with a 3-1 win over Mick Doabe in a high scoring game. 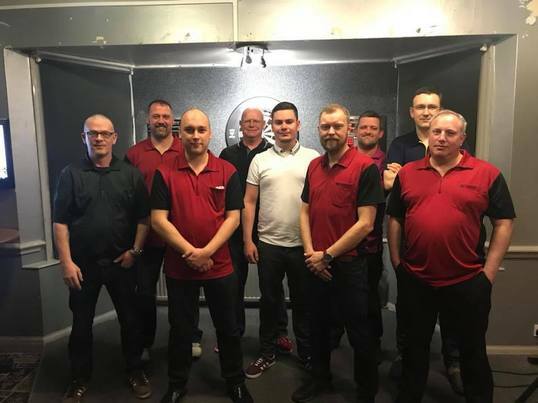 Dan Grimmett levelled the score defeating Stuart Hope, then Worthing took the lead with James Greenfield producing a Man-of-the-Match performance against Warren Freer, winning 3-1 with a 29.43 average including a twelve dart leg . Newhaven fought back to take the next game, Chris Smith defeating Del Furminger by 3-1. Worthing’s Jason Yates made the match score 3-2 with a 3-2 win against Michael Hammond, but Newhaven took the next three games to ensure victory. 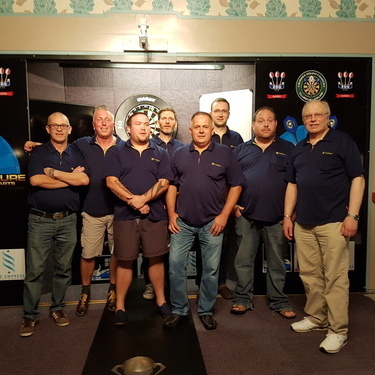 Wins for Andrew Sexton, Todd Rainsley and Darren Woolgar against Paul Paice, Richard Dixon and Lee Gladman gained the Engineer side the decisive five game result. The final game of the evening went to a fifth deciding leg with Ron Clarke defeating Steve Cross, a consolation win for Worthing. 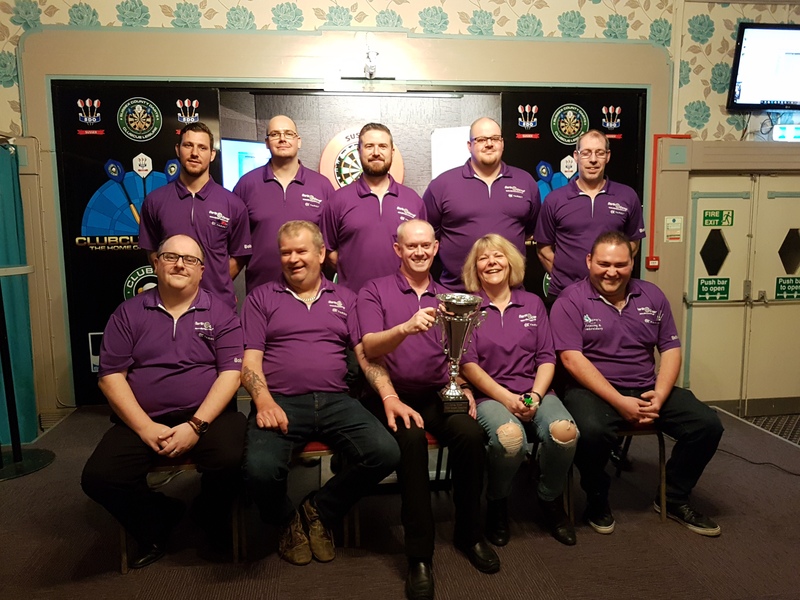 The 5-4 win for Newhaven meant the title with its £500 prize money and the return to the East Division of the “King and Barnes “ Cup for the fourth year running. The result sheet can be viewed here. Week 10 - Click here for Draw - Final standings can be viewed here. On behalf of SDO. I would like to congratulate Worthing and Newhaven on their achievements in winning their respective leagues this summer 2018. And wish both teams the very best in the final play off on Wednesday 29th at the county headquarters Worthing. I do hope that all involved with Sussex super league albeit players or supporters and committee members will attend and give support to this competition. I would be most grateful if team secretaries would remind their players of this final match. Also I'm pleased to announce that Elaine Chapman has confirmed that she will be in attendance to present the trophy to the winning team as the chairperson of Sussex county and super league . 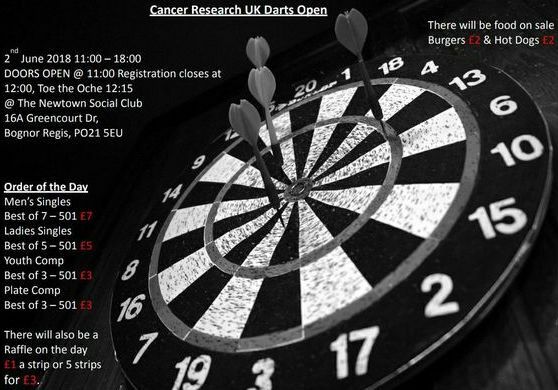 Charity Darts Open Saturday 25th August at ClubCue Worthing organised by Gregory Smithers. Raffle and other draws all in aid of BREAST CANCER UNIT AT WORTHING HOSPITAL. ALL monies in for competitions paid out. Please bring a raffle prize if possible and any donations would be gratefully accepted. Here's hoping for a good turn out for this event. Registrations 12.00 to 12.45pm. First toes to the oche at 1.00pm. The home game on 28/04/19 is subject to change as this is a Senior County weekend possible alternative date will be 19/05/19. Alternatively send by post to Chris Levett 75 Irene Ave, Lancing, BN15 9NY. I would like these back by 2nd September. I REMIND YOU THAT UNDER RULE 11 “TEAMS NOT REPRESENTED WILL NOT BE CONSIDERED FOR INCLUSION AND NO LATE ENTRIES WILL BE ALLOWED" WE HAVE LOST TEAMS BECAUSE OF NON-ATTENDANCE, A PHONE CALL ON THE MORNING OF THE MEETING WILL NOT SAVE YOUR TEAM FROM EXCLUSION. IF IN DOUBT GET ONE OF YOUR PLAYERS TO ATTEND REPRESENTATIVES OF NEW TEAMS WISHING TO JOIN THE LEAGUE ARE WELCOME TO ATTEND BUT SHOULD ADVISE ME BEFORE THE DATE. These have been updated ahead of the forthcoming County Season. The Ladies Winter Superleague AGM will be held on Sunday 2nd September 2018 at Clubcue Leisure. Following the AGM an 'Open' competition will be played. All Ladies are welcome. Depending on numbers a Round Robin format may be used. Week 5 - Click here for Draw - Current standings can be viewed here. The Ladies Superleague Winter Season will be commencing in September. Any new teams wishing to enter please see attached letter. It is proposed that the Ladies will split into East and West Divisions. Week 4 - Click here for Draw - Current standings can be viewed here. Week 3 - Click here for Draw - Current standings can be viewed here. Week 2 - Click here for Draw - Current standings can be viewed here. Week 1 - Click here for Draw - Current standings can be viewed here. ON SUNDAY JULY 8TH 2018 TO COMMENCE AT 11AM. 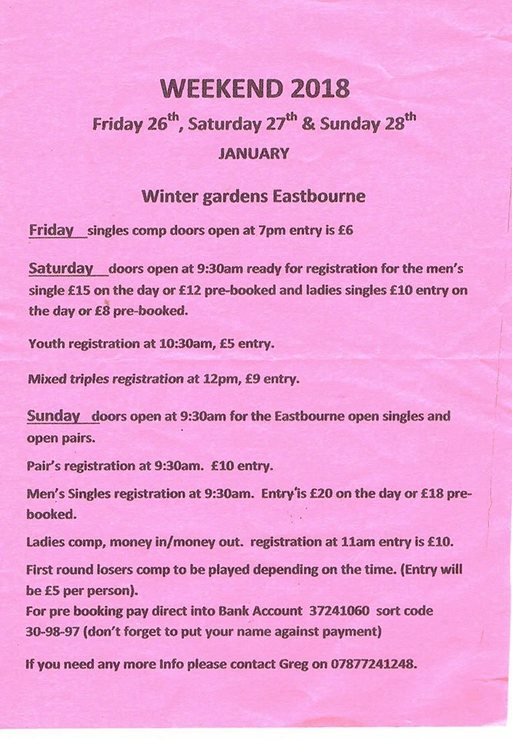 Entry is open to all SCSL, SWSL and SLSL registered players except members of Counties other than Sussex or members of the P.D.P.A. The Sussex D.O. subsidy may be withheld and entry to future qualifying events may be prevented, if this condition is not observed. 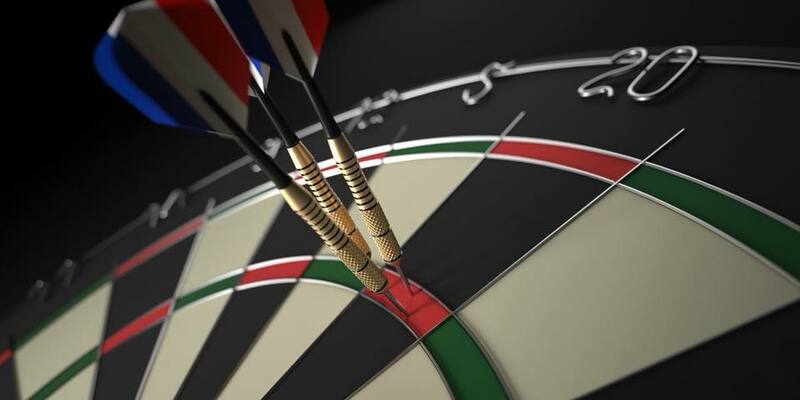 The AGM of the Sussex Darts Organisation will take place on Sunday 8th July at Clubcue. 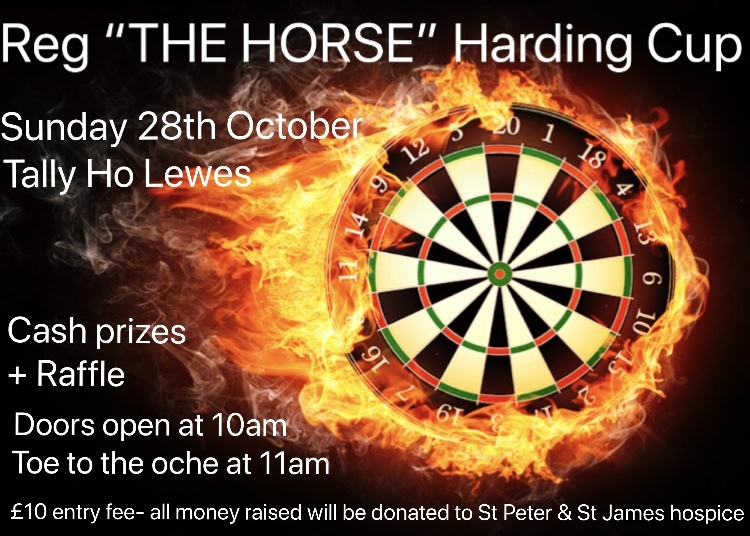 This will be followed by the Winmau Masters Sussex Playoffs. Anyone wishing to stand will need to be nominated and seconded by any super league registered player. Please forward names of anyone interested to myself ASAP please. Click here to download the latest version. Special thanks to Ian Hackett (Newtown Bognor) for maintaining the scoring software. My congratulations go to Sussex as Champions and Hertfordshire as Runners up on gaining promotion to Division One. The fixtures for Sussex's return to Division One of the British Inter Counties Championships are now available on this website to view and download. 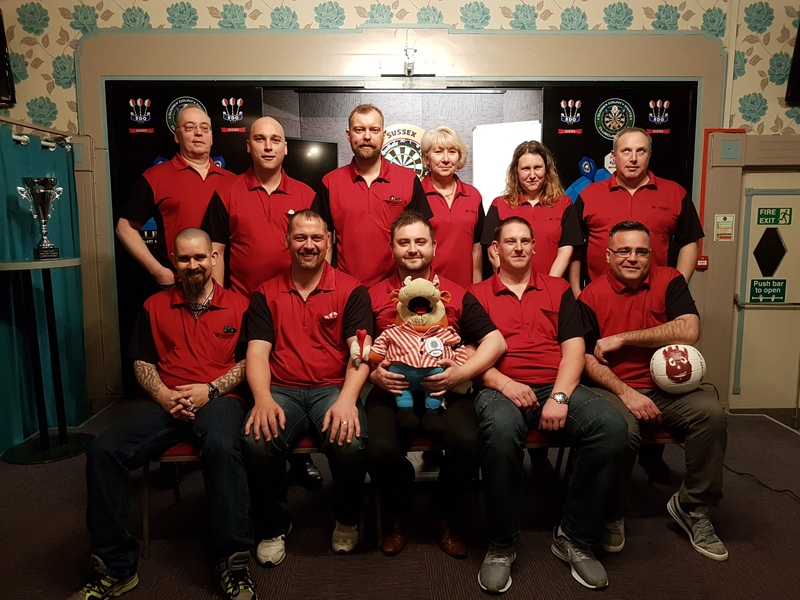 The Sussex County Winter Super League playoffs at the County venue, the Clubcue Leisure in Worthing on Sunday featuring three competitions and attracted a good crowd from across Sussex. Dan Bradford/Craig Stoner and Kevin Fishwick/Courtney Wilson. A whitewash for the West Division on the day with the final event of the day, when Tony Ayres won the prestigious Champion of Champions Cup with its cash prize of £100. 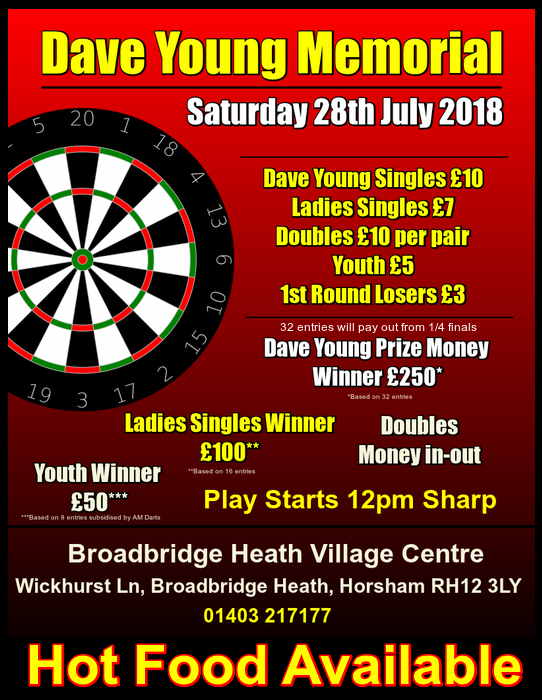 The Broadbridge Kings player did not find it easy in the final where his opponent, Newhaven’s Michael Hammond took the match to the fifth leg but Tony clinched the match 3-2. Losing semi-finalists here were Aegir Bjornsson, Lirttlehampton and Todd Rainsley, Newhaven. Fifteen players shared the Competition prize fund of £680 and more than £2700 was distributed to the fifteen teams in the League. The fixtures for the 2018 Summer County Superleague are now available to view on the website. The season will start 9th May 2018. The Winter 2017/18 results and statistics can be found in the Superleague Archive Section. Please note the change of date from the original fixture list. Please note that the Team Registration Meeting of the Sussex County Summer League will be held on Sunday April 22nd 2018 at 11am. This will be followed by the Playoffs plus Presentation of the Mens Winter Super League. “TEAMS NOT REPRESENTED AT THE MEETING WILL NOT BE CONSIDERED FOR INCLUSION AND NO LATE ENTRIES WILL BE ALLOWED"
We have lost teams because of non-attendance, a phone call on the morning will not save your team from exclusion. If you are unable to attend get one of your players to stand in. Written notice of member’s intention to change/add a rule is required by April 15th. Representatives of new teams wishing to join the League are welcome to attend but should advise me before the date. by 7-2. Littlehampton scored 61 tons with Newhaven registering 46 tons and both teams hit one maximum. Littlehampton reached the playoffs after remaining unbeaten in twenty one matches in the West Division, winning by nineteen points from Worthing. Newhaven lost just one match to win the East Division by fifteen points from Lewes. 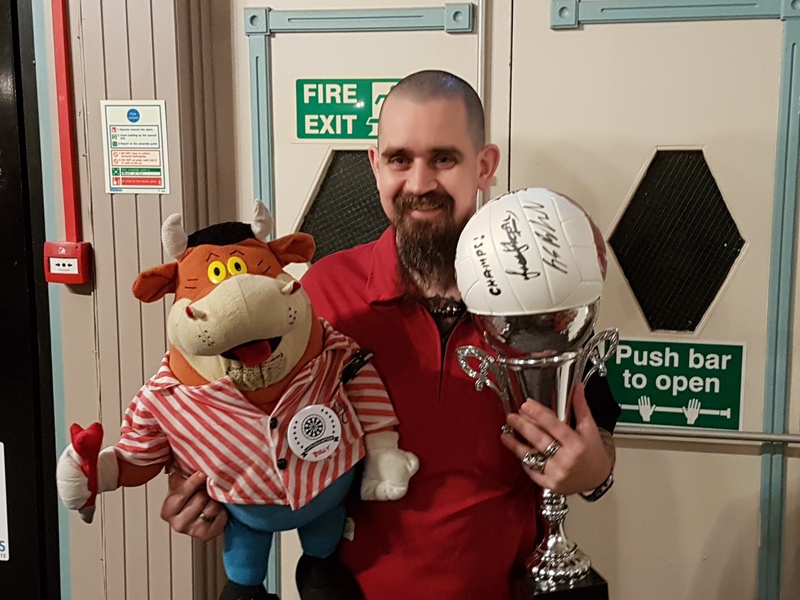 Adrian Linfield got the ball rolling for Littlehampton with a 3-1 win against Darren Woolgar, with Adrian achieving a 27.77 average, which include a thirteen dart leg, a maximum and won him the Man-of-the-Match award. Aegir Bbjornsson made it 2-0 for the Terrace Club team, with the second of four 3-1 wins over the evening, this against Paul Eves. Michael Donegan defeated Craig Stoner 3-0 to put Newhaven on the scoreboard and their captain Michal Hammond levelled the score with a 3-0 win against Simon Wood. Sadly for The Engineer team that was their last success of the evening with Newhaven winning just four legs in the remaining five games. Courtney Wilson defeated Donna Rainsley3-0, James Stephenson beat Todd Rainsley 3-2 and Cliff Prior secured the title for Littlehampton with a 3-1 win against Chris Smith. 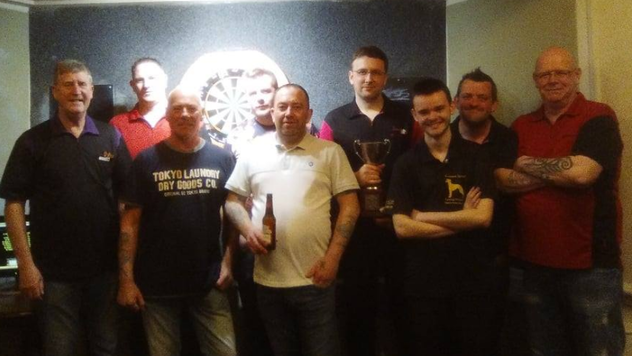 Dan Bradford’s 3-1 win over Dave Creasey and Kevin Fishwick winning 3-0 against Paul Dickens made the final score 7-2 to Littlehampton who now hope to go one better in July, when they travel to Rotherham, where they represent Sussex in the British Champions Cup. The Match this weekend has been postponed. Please see below the following message from Chris Levett. Following on from my earlier post regarding the postponement of the match vs. Worcestershire, this has now been re-arranged for the 19th/20th May. As you can imagine it hasn’t been easy to find a date with the amount of games we have at the end of the season plus a BDO meeting plus bank holidays plus youth matches. Hopefully you are all available for this match is now the last game of the season. England Darts - The Legends of Darts Masters - Promotional Brochure can be viewed here. Our last game of the year took us to a snowy Plumstead to face London in another tough game for the Sussex Youth Team. Alex Gurr got us under way with a 3-0 win (16-16). That was followed by a brilliant man of the match display from Jack Seymour winning 3-1 with an impressive 27-66 average. Tavis Dudeney kept the winning start going winning 3-0 with a 23-86. So with one more win needed to make it an unbeaten year for the U18s, it was down to Lewis Gurney to do the job which he done winning 3-0 with a 22-77. So with victory in the bag it was Anthony Smith try to keep the winning run going which he done 3-0 (17-08). Jack Croft kept his 100%start to the season winning 3-1 (16-65). Jack was up against 8 year old Leo Gaffney who not only took a leg but also hit a couple of ton plus scores, definitely a star for the future and we took the unusual step of awarding a player of our opponents the Performance Of The Day award because we thought he deserved it. Finally for the U18s was Dan Perry who made it a clean sweep winning 3-0 with a 21-47. Next up was the Girls, leading the way was Jenny Lovegrove who although played really well just couldn’t hit those magical doubles and went down 3-0 with a 11-30. Next up PJ Langridge who battled well and come through winning 3-2 with a 13-59. Finally was Ashleigh Turner who also had hard fight but came out on top with a Lady Of The Match 3-2, 16-16 win. So on to the U21s first up making his 50th appearance for Sussex was Connor Levett who made it a winning 50th appearance 3-0 with a 23-12. That was followed by Dan Green who was moved up from the 18s to the 21s stormed into a 2-0 lead but was pegged back and sadly lost 3-2 with a 22-92. Cavern Crash Philips Transferred from Glamorgan to make his debut for Sussex and after a shaky start came through 3-1 with a 21-40. So with one more win needed for a clean sweep Harry Jackson stepped up with a great Man Of The Match Performance winning 3-1 with a 26-88. Finally Dennis Bowyer stepped up but sadly lost 3-1 with a 22-56. 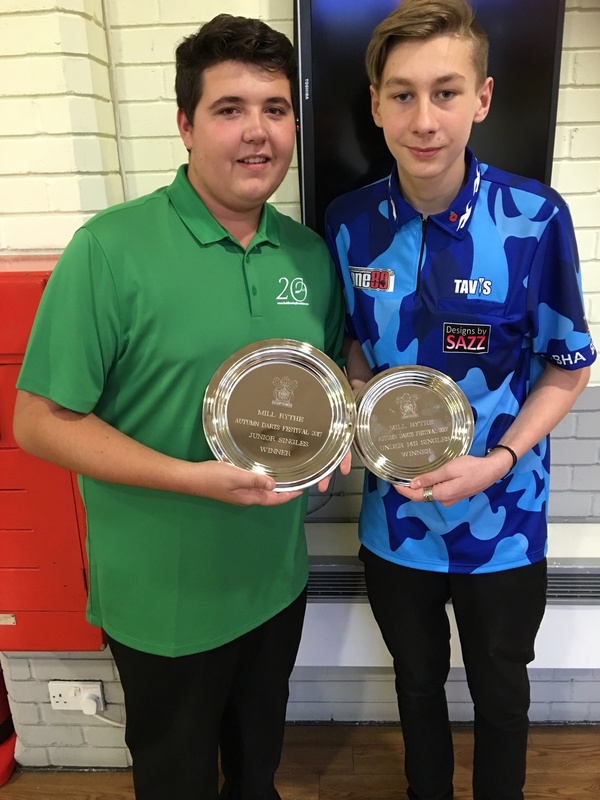 So brings down the curtain on a fantastic 2017 which has seen the U18s and the Sussex Team being unbeaten, both Under 18s and U21s being Crowned Champion Of Champions, Alex Gurr getting his England call up, and Tavis Dudeney runner up in the singles championships. Well done to everyone and here’s to a successful 2018. 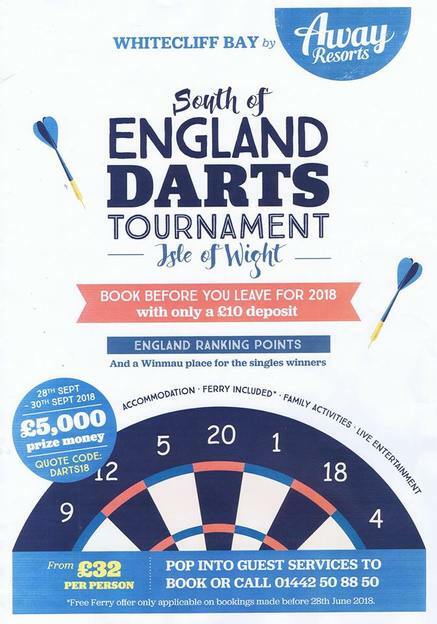 Please find attached details of the 2018 Barbados Darts Festival which I hope you can circulate to your darting community in Sussex. Thomas Cook Airlines have already published schedules for November 2018 out of Manchester at an excellent return fare of c.£460. These are likely to be snapped up pretty quickly, so booking early is the key. We can then sort out the hotel accommodation when we know the flight dates of those wishing to come from our allocated rooms at our HQ hotels. BA & VIRGIN OUT OF GATWICK WILL SOON HAVE THEIR SCHEDULES OUT. Hope you and some of your circle can make it. I live in Henfield, West Sussex, and would be delighted to meet up to discuss things if that would be of benefit. 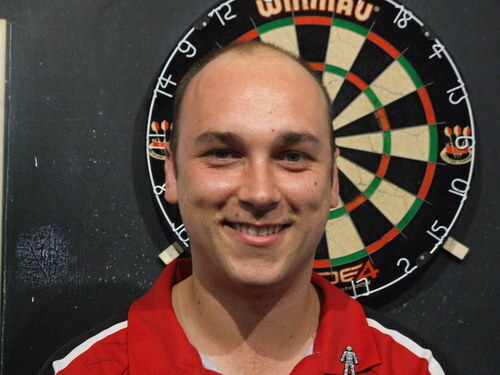 Congratulations to Brighton's Joe Davis on reaching the final of the recent Malta Open. Well Done from all at Sussex Darts. 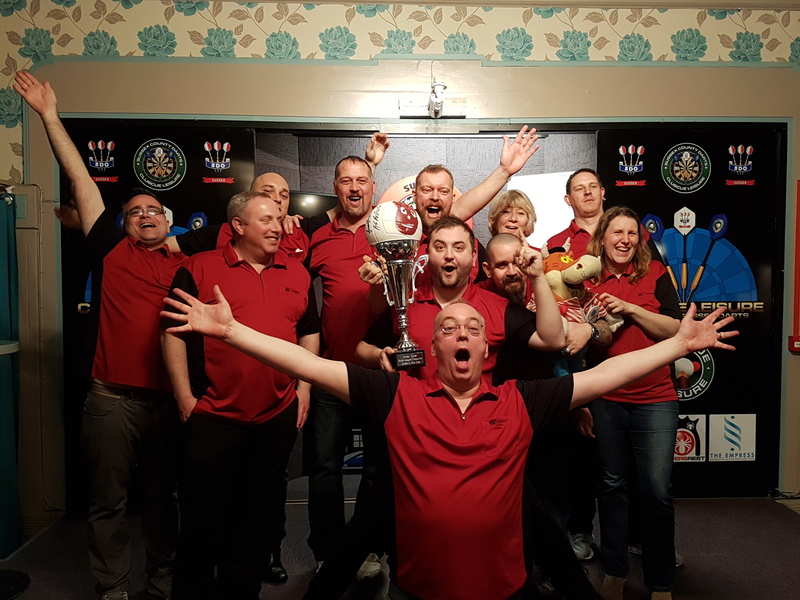 At the weekend we were in Hayling Island for the November Darts Weekend and Sussex Youth once again were looking for a clean sweep and they wasn’t going to be disappointed. In the under 14s Tavis was going for three out of three in his last Under 14s which he managed winning 2-1 in the final. In the under 18s there was another dominating performance from Sussex Youth, after an all Sussex semi Final with Jack Seymour getting the better of Mays winner a Tavis Dudeney and making his debut Freddie Jackson beating Mays runner up Alex Gurr. This was Jacks Final Under 18s and wanting to add to his 2015 November and 2016 May Tittles which he duly done winning the final 3-0. 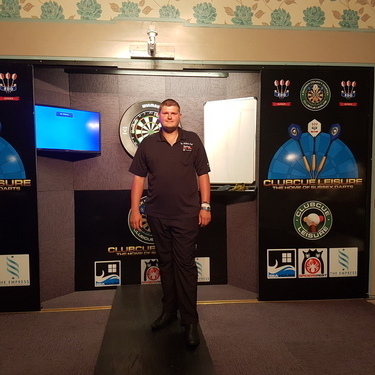 Congratulations to Littlehampton's Dan Bradford who won through the regional playoffs on Sunday at the 6 in 1 Club, Tonbridge, to reach the finals of the Winmau World Masters at Bridlington Spa, Yorkshire. The 44th Winmau World Masters takes place between 25th and 27th September 2017. Best of luck Dan! The Pairs event was won by Mick Rodgers, representing the West Division winners Worthing partnered by Littlehampton player Simon Wood. They defeated the Crawley/Southwick duo Alex Gurr and Graham Harris by 3-1 in the final, collecting the “Harveys Rosebowl plus £100. Losing semi-finalists were Nathan Warren/Adrian Linfield, Littlehampton and last season’s winners Tony Ayres/Tony Peters from Broadbridge Kings. The King’s gained consolation when their star player Danny King took the honours in the two singles events. Danny won the “Brooke Sports” Singles cup when he beat Southwick’s Andy Macintosh by 3-0 in the final to take the £100 prize. The losing semi-finalists were Craig Stoner, Littlehampton and Dave Creasey, Newhaven. Danny continued his winning run in the final event of the day when he won the prestigious Champion of Champions Cup with its cash prize of £160. 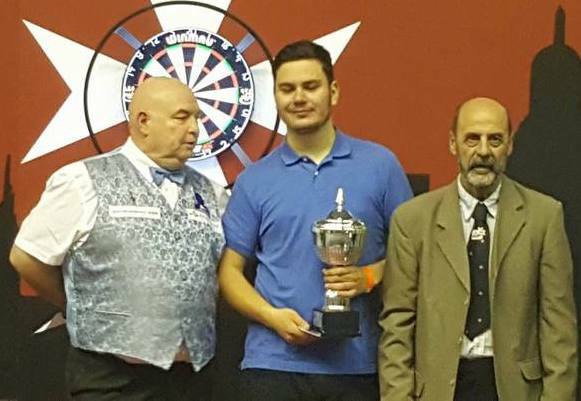 The Broadbridge player did not find it easy in the final where his opponent, Craig Stoner, Littlehampton hit two maximums and took the match to the final leg with Danny checking out to win 3-2. Losing semi-finalists here were Mark Harwood, Mid Sussex and Joe Davis, Southwick. Fourteen players shared the Competition prize fund of £680 and more than £2300 was distributed to the sixteen teams in the League. Roll of Honour can be viewed here. 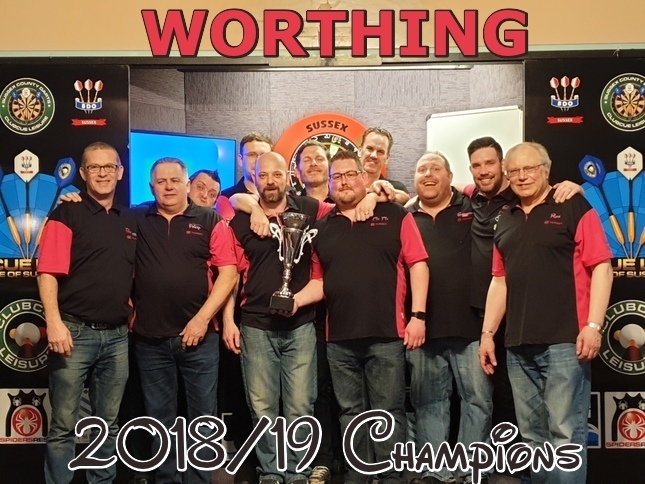 Hastings retained the County Super League Championship for the third year running in an exciting playoff at the Clubcue Leisure, Worthing defeating the West Division winners Worthing by 5-4. The Millers Arms team had previously won their Division by eleven points from Lewes losing just one of their fourteen matches. The Worthing side were unbeaten in their fourteen matches this summer and they had beaten off a strong challenge from previous winners Littlehampton to take the West Division title by eleven points. Mark Stafford started the ball rolling for Hastings with a 3-1 win over Richard Dixon in a high scoring game. Paul Paice levelled the score defeating Ray Tutin by 3-0, then Worthing took the lead with Mick Doabe’s 3-2 win against Andy Derrick. Hastings fought back to take the next two games with Darren Chapman’s 3-1 win against Lee Parsons and Ade Boyle winning 3-1 over Steve Hart. Worthing’s James Greenfield levelled the match score with a 3-0 win against Phil Wanstall and Ron Clarke’s 3-2 defeat of Simon Smith put the TMG Club side back in the lead. Another five leg game saw Adam Bryant winning against Lee Gladman to keep Hastings in the match. 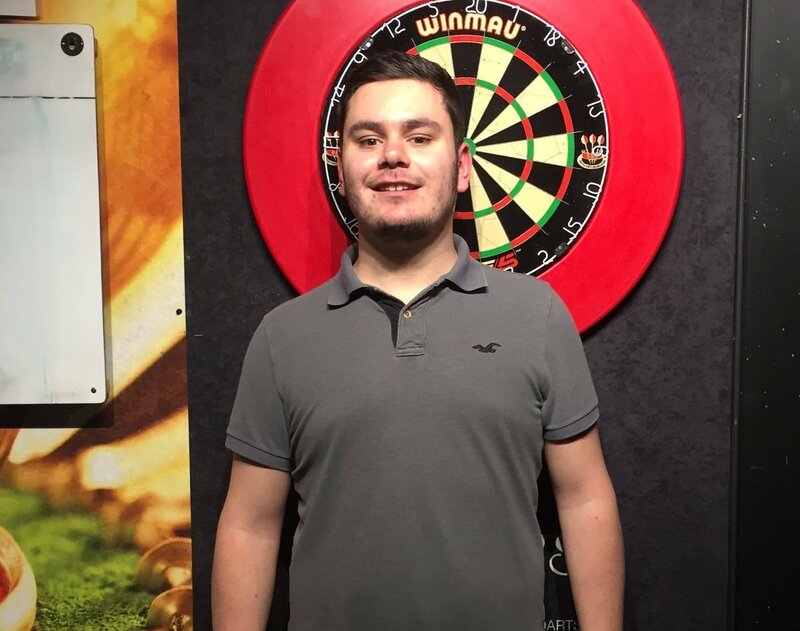 The final game of the evening went to a fifth deciding leg with Luke Hardy defeating Richard Stanford in twelve darts, with a game average of 28.71 which guaranteed him the Man-of-the-Match award. That clinched the 5-4 win for Hastings, the title and the return to the East Division of the “King and Barnes“ Cup for the third year running. Congratulations to Jim Withers, Champion of the 1st Target Brighton Open, beating Adrian Gray 6-5 in the final.